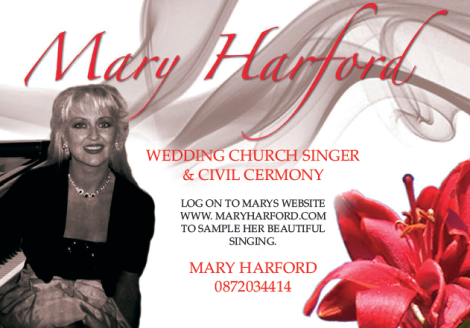 “Mary is one of the most charismatic wedding singers I have experienced”. Celebrate your Wedding with Beautiful Music Performed by Professional Wedding Singer. The wedding ceremony is the most special part of your wedding day, for the bridal party and your guests. Mary as an experienced professional singer will help you pick carefully chosen songs that will enrich the moment. Celebrate your love with beautiful music making your wedding day unforgettable. Mary, using her years of experience as the wedding singer will give you unparalleled advice. Carefully chosen wedding music and wedding singer will enrich the moment and add something special to the air. In conjunction with Mary, you will select a list of songs from a variety of truly wonderful range. No idea what you want? No worries! With years of experience in the wedding singing business, Mary will advise you on what she would recommend to be played during your wedding and when it should be played. “I like to help each and every couple, to make their wedding day that extra bit special”.